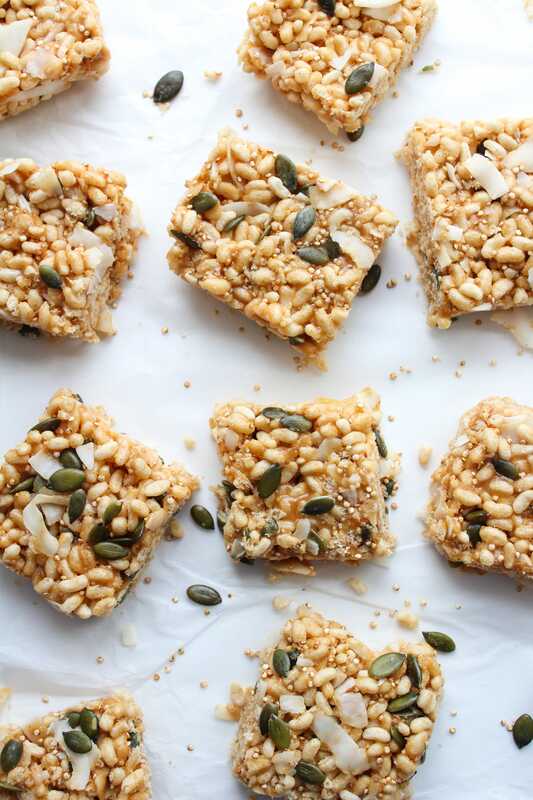 Superfood Vegan Rice Krispie Treats – a childhood favorite reimagined with a few healthier tweaks and additions. Organic puffed brown rice with toasted quinoa, coconut flakes, and pepitas mixed together in a nut butter glue. Hi my name is Sarah. Instead of giving up junk foods that aren’t good for me I like to come up with ways to make them healthier so that I have an excuse to eat them. See also: paleo pop tarts and healthified snickers bars. I got the idea for these rice krispie treats from these toasted marshmallow, quinoa, and cashew butter ones I saw on How Sweet Eats a few weeks back. As soon as I saw them I was sold. When it comes to my favorite childhood junk food – I just can’t help myself. My thoughts basically went from: YUM ➡ WANT ➡ NEED ➡ MAKE all within about 10 minutes. Except when making it I wanted to make a few tweaks here and there so that I could rationalize going back for seconds. As much as my mouth enjoys browned butter and toasted marshmallows, my waistline would beg to differ. You understand? I used peanut butter in the video making these that you can see above, but you can use whatever nut butter you have on hand. When it comes to the sweetener, brown rice syrups worked the best, followed by agave. You can use maple syrup if you like, but just realize that it’s not as sticky as agave or brown rice syrup, so your rice krispie treats may not be quite as firm. Honey would also be a good option if you’re not overly concerned about making this fully vegan. However you make this – I hope you like them as much as we did! 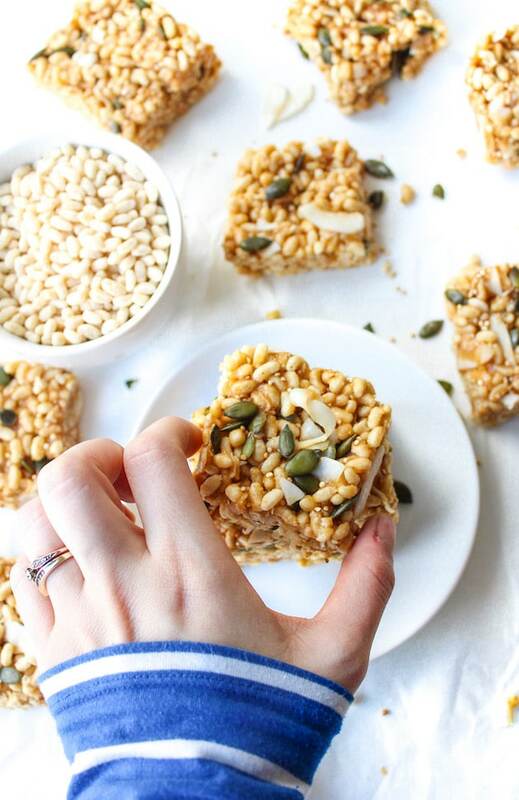 Don’t forget to #asaucykitchen on instagram if you make these vegan rice krispie treats! I love seeing what you make with! You can also post your pictures to our facebook page! Add peanut butter, brown rice syrup, vanilla, and salt to a sauce pan over low heat. Stir until the mixture is all melted together. Pour the puffed rice cereal into a medium bowl along with the toasted quinoa, coconut flakes, and pumpkin seeds. Pour the almond butter mixture over the cereal and stir until evenly coated. 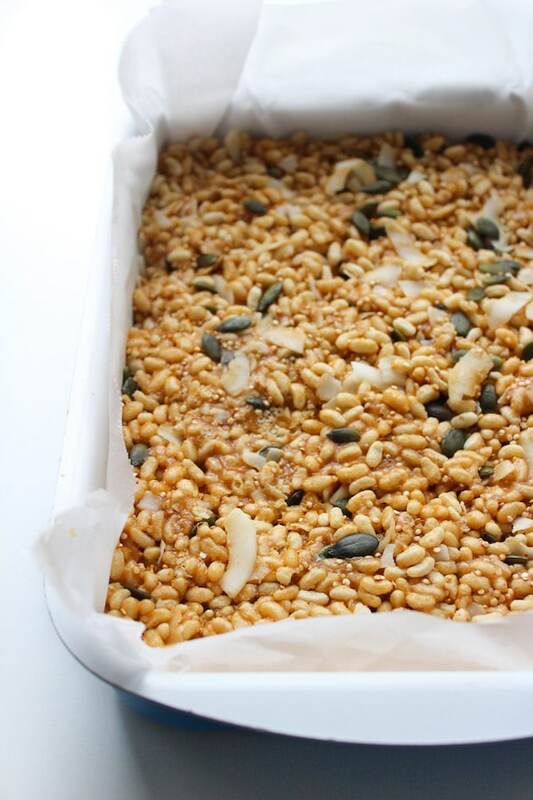 Scoop the cereal into a glass baking dish or pan (line with parchment for easy clean up) and firmly press the mixture down until it's tightly packed. The harder you press, the firmer these will be. Place in the fridge for about 20 minutes to allow to cool completely and to set before cutting into squares. Hi, I have to watch my sugars, what’s a good substitute for brown rice syrup? Hi Nicole! I’m afraid I’m not too familiar with low sugar sweeteners so I’m not sure how much of a difference another sweetener might make. They’re not easy to find where I live so I don’t get to play around with them much. If you can find a low carb sweetener that comes in a syrup form like the rice syrup that would be ideal! The syrup works as the glue in this recipe so you’ll need a comparable kind of texture to make this work. These were wonderful!! I had to add a little bit of cacao nibble. Love it! Thank you. Oooh love that idea! Thanks for coming back to leave a comment! Stick coconut in anything and you’ve sold me! Love the addition of quinoa in here too – it’s got this great texture that I also like to add to salads. Yum! Now this is “junk food” done right! 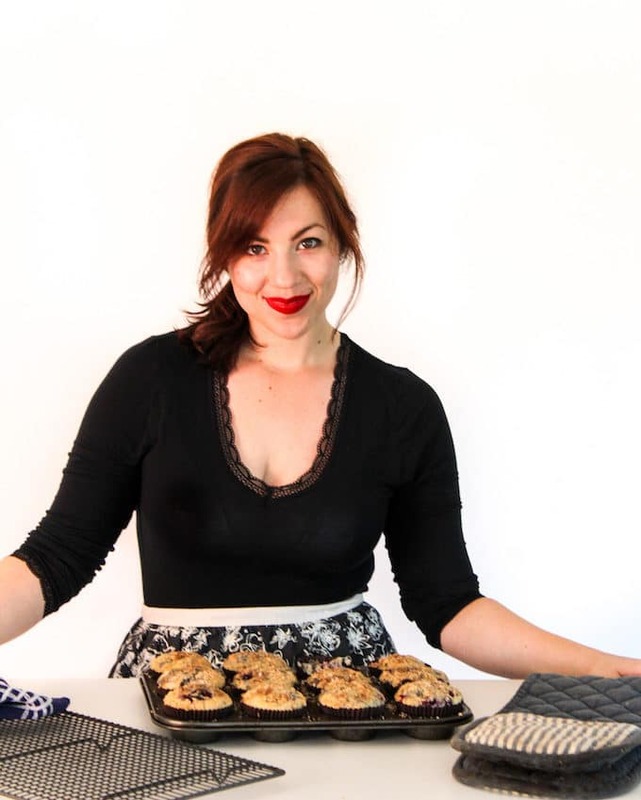 I agree, I can never give up on my sweets, but thats where the blog comes in; making healthier versions of my favorites! I’d love to snack on these when my 3 pm cravings hit!